At the risk of stating the obvious, the sound of this choir is very different to what one would hear from a Russian or East European group, but I’m not sure how much that matters: Rachmaninoff’s liturgical masterpiece has made its way, in whole or in part, into the repertoire of a good number of Western church and cathedral choirs. What really matters is the quality of the performance and in this instance it’s impressive. The size of the choir is a consideration. John Scott’s team comprises 25 trebles, five male altos, six tenors and seven basses. The resulting sound is quite bright on the top line – though not excessively so. The basses do well though their collective sound is nowhere near as sonorous as I’ve heard from Russian choirs or, for that matter, from a group such as Charles Bruffy’s combined Phoenix and Kansas City Chorales (review). That said, I enjoyed the singing of the Saint Thomas choir very much indeed. John Scott gives the music space, but he’s not over expansive. His overall performance time of just over 58 minutes is significantly shorter than Charles Bruffy’s 75:34. It’s also quite a bit less than the 66:27 taken by Matthew Best and the Corydon Singers, another version I greatly admire (Hyperion CDA20460). Reassuringly, however, Scott’s timing is not too far away from the 61:51 taken by the St Petersburg Cappella under Vladislav Chernushenko (review). Bruffy and, to a lesser extent, Best, allow much of the music to unfold in a spacious manner. Scott is by no means afraid to adopt a broad tempo where he feels it’s justified but he’s rather more inclined to inject urgency into the settings of joyful praise. I’m happy with either style, subject, of course, to the quality of the performance in question. As I indicated, this New York performance is consistently well sung. Immediately a positive impression is made in the opening movement, ‘Come, let us worship’. (I hope I’ll be forgiven for using the English titles for ease of reference.) This first setting is strongly and confidently sung; it’s an enthusiastic summons to prayer. I noted the attention paid to hairpin dynamics which, to be honest, is more observantly done than in many performances I’ve heard. Ory Brown’s warm, expressive mezzo makes a pleasing impression in ‘Praise the Lord, O my soul’ in which she’s supported by nicely poised choral contributions. The other soloist is the tenor, who is involved in the fourth and fifth movements. David Vanderwall has a ringing voice and he does well in both his solos; he copes well with the demandingly high line in the famous ‘Lord, now lettest thy servant depart’ solo. At the end of that movement the basses have that treacherous descent to a bottom B flat. It would be idle to pretend that the New York singers have that cavernous quality that some other bass sections have achieved on disc, but their descent is secure and accurate. ‘Rejoice, O virgin mother of God’ (movement 6) is rapt and gentle at the start, but rises to an ecstatic climax. I admire the way that the music of ‘O praise the name of the Lord’ (movement 8) dances joyfully. In ‘The Resurrection of Christ’ (movement 10) Scott ensures that his singers make the most of the dynamic contrasts. In several movements there’s a genuine fervour to Rachmaninoff’s climaxes. ‘Today is salvation come unto the world’ (movement 13) offers an excellent example and here the sound of the boys’ voices give an exciting edge to the choral texture, a feat they achieve at other times as well. As proof of how well the choir has been trained one need look no further than movement 12, ‘Glory be to God on high’. This contains some of the most varied and complex music in the entire work, but the choir deals with it very well indeed. The concluding movement, ‘To Thee, our leader in battle’, is joyfully done. Here too the brightness of the trebles adds a frisson to the choral sound. 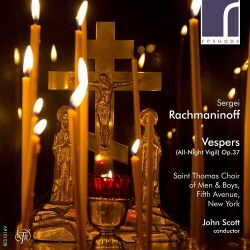 This may not be the only way to perform Rachmaninoff’s All-Night Vigil, but this recording shows that the music can be convincingly done by a choir reared in the Anglican/Episcopalian choral tradition. What matters most is the quality of the training imparted to the choir and in this instance it’s clear that John Scott had prepared his singers very thoroughly. The quality of the singing is very pleasing indeed, not least the tuning. It’s many years since my faltering schoolboy attempts to learn Russian, but so far as I could tell the choir’s pronunciation is very good. The recording was engineered by John C Baker. I think he’s done a very fine job, presenting the choir in very attractive sound and also giving us a nice sense of the resonance of the Saint Thomas acoustic. The notes are by John Scott himself and they provide an excellent guide to the music.